From left are Jeonghwan Park, Professor Soojin Park, Professor Kwanyong Seo, Dong Hyup Kim, Professor So Youn Kim, and Woo-Jin Song. Their work has been published in Advanced Energy Materials, one of the most prestigious journals in the field of energy. The current development of stretchable battery materials that mimic the functions of nature has emerged as a highly interesting research area, necessary for the next wave of wearable electronics. 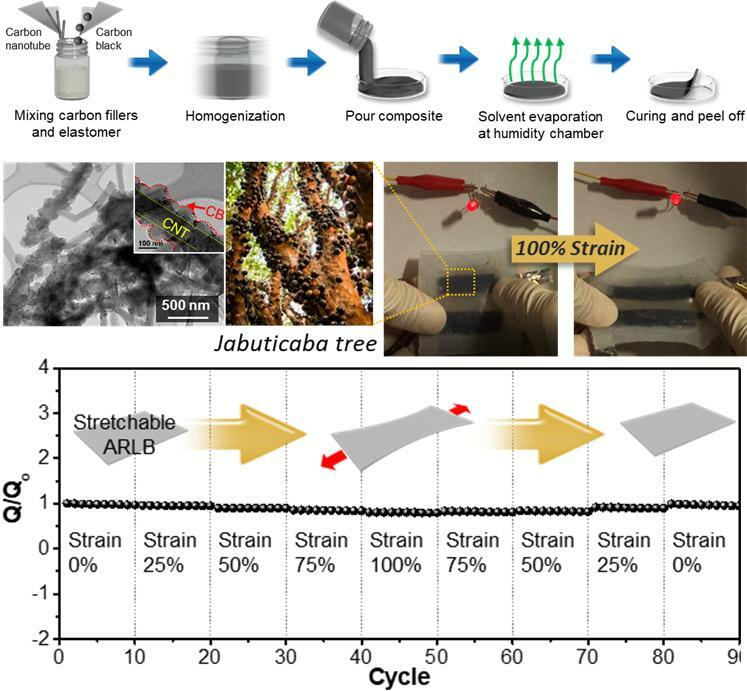 A recent study, affiliated with UNIST has presented a bioinspired Jabuticaba-like hybrid carbon/polymer (HCP) composite that was developed into a stretchable current collector using a simple and cost-effective solution process. Using the HCP composite as a stretchable current collector, the research team has, for the first time, developed a highly stretchable rechargeable lithium-ion battery (ARLB) based on aqueous electrolytes. This breakthrough has been led by Professor Soojin Park in the School of Energy and Chemical Engineering in collaboration with Professor Kwanyong Seo and Professor So Youn Kim in the School of Energy and Chemical Engineering at UNIST. Schematic showing the sequences in the overall fabrication process of HCP electrodes. Stretchable electronic devices have recently attracted tremendous attention as next-generation devices due to their immense flexibility. 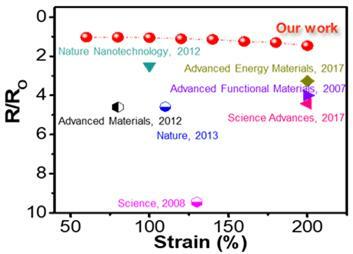 The increasing interest and demand of flexible electronics has fueled the search for highly stretchable electrodes with high mechanical durability and high electrical conductivity during deformation. 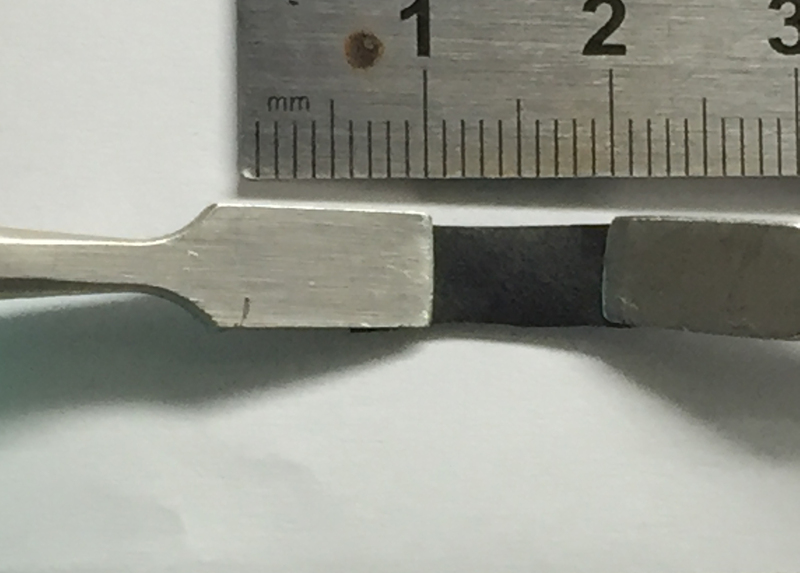 Although many methods have been proposed for these electrodes, none of them has managed to simultaneously achieve high stretchability for the electrodes and have a scalable manufacturing process. 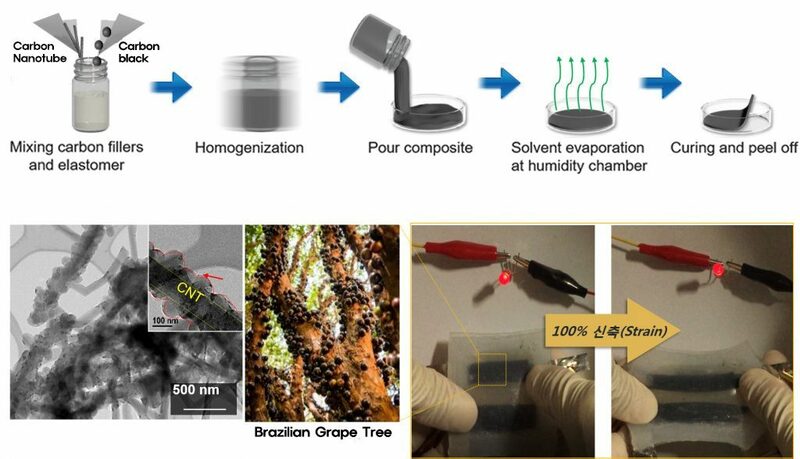 Professor Park solved such issues using a conductive polymer composite, composed of Jabuticaba-like hybrid carbon fillers containing carbon nanotubes and carbon black in a simple solution process. The shape of this structure resembled that of a Jabuticaba tree, the Brazilian grapetree. 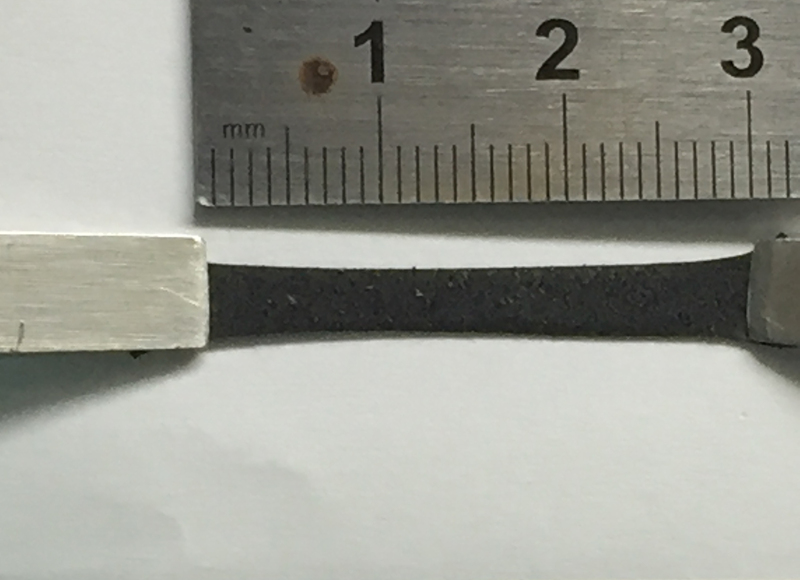 The research team observed that the HCP composite is found to effectively retain its electrical conductivity, even under high strain rates. 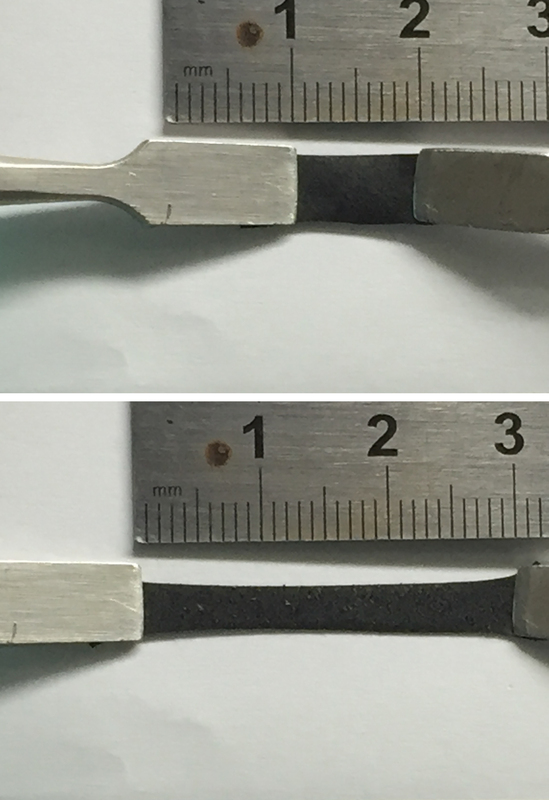 This makes it suitable for use in highly stretchable aqueous Li-ion batteries. Schematic showing the comprehensive structural development of the HCP composites under strain. “Our findings are expected to expand the number of stretchable nanocomposites with electrochemical and mechanical properties available for use in a wide variety of applications,”says Professor Seo, who was in charge of the fabrication of stretchable current collectors. A detailed analysis of the percolation behaviors of the conductive filler within the composite was done using an in situ SAXS measurement under stretching, which revealed that the different types of carbon in the filler led to a formation of highly interconnected cosupporting networks. Professor So Youn Kim led the in situ SAXS experiments. SAXS is a highly useful technique for measuring the behavior of nanofillers in polymer matrices. Besides, the research team has, for the first time, developed stretchable ARLB as a stretchable power source, using the HCP composite as a stretchable current collector and they have delivered stable power to a LED even under 100% strain. “This study is expected to facilitate the design of stretchable nanocomposites with optimized electrochemical and mechanical properties for use in energy storage devices and stretchable electronics,” says Professor Kim. This study has been supported by the Center for Advanced Soft-Electronics funded by the Ministry of Science, ICT and Future Planning as Global Frontier Project and the 2017 Research Fund of UNIST. The work has been published in the January 2018 issue of Advanced Energy Materials, one of the most prestigious journals in the field of energy. Woo-Jin Song, et. al., “Jabuticaba-Inspired Hybrid Carbon Filler/Polymer Electrode for Use in Highly Stretchable Aqueous Li-Ion Batteries,” Advanced Energy Materials, (2018).